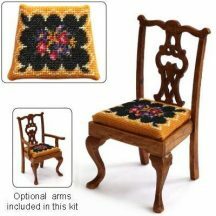 To make the seat cover ONLY – this kit does not contain any wooden parts for the chair itself. 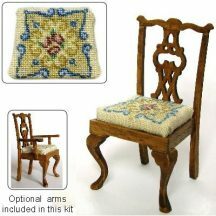 It only contains the materials necessary to make the stitched seat cover, to fit over the seat pad of a chair similar to the one in the full dining chair kit shown in this section. This pack is for those of you who already have a chair kit, and just need the stitching part. It contains 32 count silk gauze, a colour block chart and detailed instructions, Anchor stranded cotton and a suitable needle. IT DOES NOT CONTAIN ANY WOODWORK. 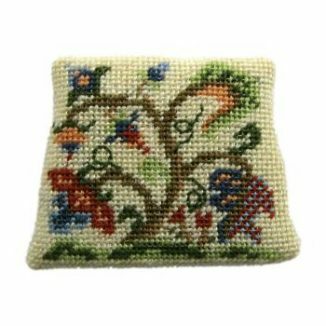 Please note that you may need to make some adjustment to the stitched area to make the needlework fit your seat pad around the edge – there is plenty of thread in the kit to allow you to do this. 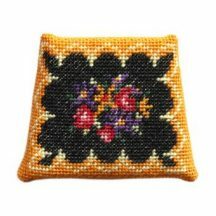 The seat pad which this design was originally made for measures 1 5/8 across the front width, 1 3/8 across the back width, and 1 5/16 deep.